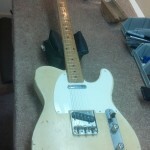 Today we we have a nice 1955 Fender Telecaster guitar that came in my shop for some minor wiring issues and a loose jack cup. 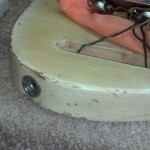 It’s all original except for a rewound bridge pickup and a spliced wire to the jack. The customer wants the wire fixed but he doesn’t want it to look “new”. I’ll have to replace the wire and age it. 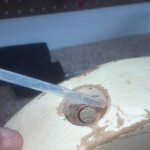 First I’ll remove the loose jack cup and reset the clip into some fresh wood. Removal of the clip needs to be careful so I don’t weaken it or chip the guitar. 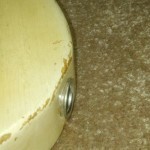 Obviously they make better jack cups to combat this issue, but being a valuable vintage guitar you never want to do anything to change originality if at all possible. So fixing the original jack cup is a must. I use my custom made tool that is designed specifically for this job. It cleanly removes the clip and perfectly resets the clip in the exact location you need. 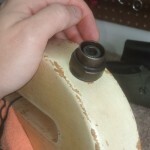 I rotated the clip 45 degrees so it would bite into new wood and securely hold into place. Now that the clip is secure, I always like to glue the corners for extra stability. The clip can still break free and be reset again in the future if needed. I use a pipette filled with medium viscosity super glue to give me precise application of the glue right where I need it. I cut the extended part of the pipette off to allow for a bigger hole to siphon the thicker glue. We’ll let that set aside and dry while I work on the wire from the input jack. You can see it has been cut and spliced together. 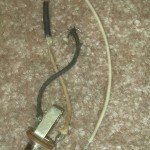 I need to run new cloth leads from the jack. 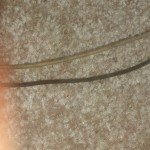 The new white and black cloth covered wire looks really new compared to the original. I need to make it look 60 + years old. I mixed up some dye in a small medicine cup with alcohol until I got a color match. Before dipping the wire in the dye, I bunched up the cloth to break the wax up and loosen the cloth. 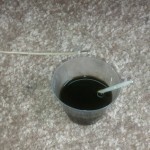 Then I ran the white and black wire through the dye and let it dry. Once the cloth wire is dry I take it and roll it in the dirt. Yes seriously I roll it in the dirt. It makes the cloth wire look exactly like the original. Dirty, dusty, and stained. You can see the wire is nearly a perfect match to the original. Not too shabby. Now I just need to fray the ends to match the rest of the wire and solder it to the jack. 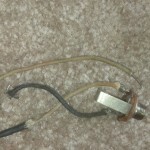 Now the “new” old wire is soldered to the jack and wiring harness. After that I secure the jack and cup tightly to the clip. Everything looks perfect and now I can screw the control plate down and send the guitar home. Thanks for viewing. Please check back again soon!